WWOA members, Dr. Roger and Judie Wilson of Clintonville along with their children Sandra, Gregory, and Dan recently discussed their woodland passions during a family weekend. Roger would like to share some of their thoughts. As the Wilsons know, to bear fruit of family – unity, sharing, caring, energy, spiritual awareness, enthusiasm, vigor and LOVE – does take much time, effort, patience and yes a passion for the farm to become a legacy. Rogers parents, George and Irene Wilson, started buying the farm in 1941. Roger remembers as a small child going to the farm. He walked in the furrow behind his father and the one horse plow. He recalls finding a treasured Indian arrowhead. At age 6, on his first deer hunt, he saw his first buck. In later years, he and his sister drove tractor to till the soil and harvest crops that would send them both to college. Over time, three generations of the family planted tree roots while building family roots. Between 1952 and 1991, 170 acres were planted with 155,000 pine seedlings. 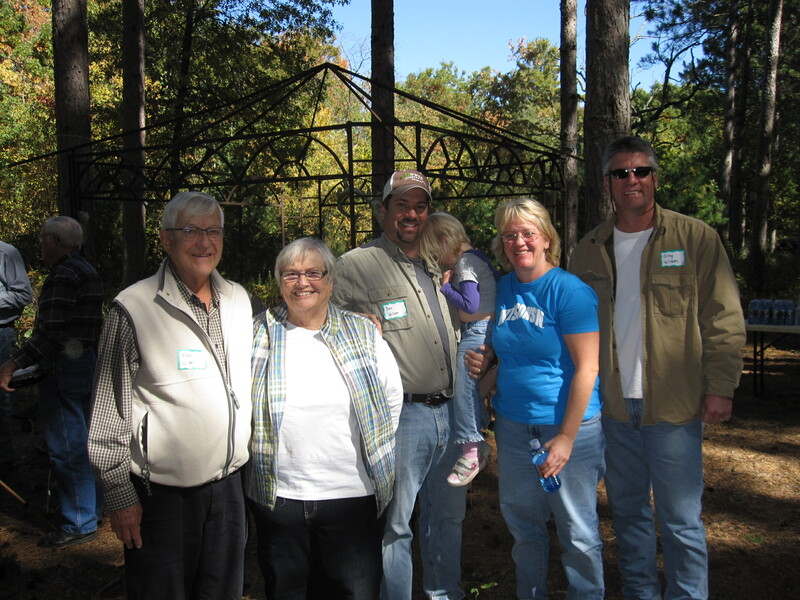 The Wilson children, spouses and even relatives helped create a tree farm. These “roots in the sand” were a strong unifying factor for developing a passion for their land, while deer hunting and camp fires were little roots helping the passion grow. In 1960, Rogers parents sold the farm to Roger and his sister, Janet. In 1976, Roger purchased his sisters share of the woodlands. Roger had serious questions about what it meant to be a woodland owner. Not being a famer also left Roger with some catching up to do. He joined the National Tree Farm System in 1966 and became a WWOA charter member in 1979. The Wilsons took specific steps to fan a flame of passion for their woods in their children. In 1988, Roger wrote a crude management plan to help focus beyond tree planting and deer hunting. It had an effect. Their children and grandchildren wanted to be more involved. A seed was taking root in the sand. In 2001, a Wilson Family Trust was put in place. On August 30, 2009 the farm was divided into three parcels and three Limited Liability Corporations (LLC) were set up. This created a deep root within our children in the sand of Waushara County. In 2006, after years of classes, articles and conversations at WWOA meetings, Judie and Roger wrote up six options for management decisions and ideas. One was selling the farm. Their children and spouses responded with pros and cons for each option. As a result the next generation started to attend some WWOA events. This proved to be a huge root builder. At a family gathering in 2007, Roger presented the idea of writing a book together about a “Mystery in the Woods.” Excitedly all everyone in the family drew lots for chapters. Each was to pick up their chapter where the previous chapter ended. This helped the grandchildren’s interest in the farm. They published it in hard cover. A giant root was planted for farm passion. All nine grandchildren have chosen to bring a special friend to visit the farm. Dani, age 4, chose her puppy, Tucker. She will plant her first tree soon. Grandson Scott and Deelia will present our first great grandchild this winter. A fragile new root has started. “It indeed has been a challenge over the years for Judie and I to fan the flames of passion to a family intensity. We feel the roots in the sand and growth in sharing our passion among our family. Once I looked up the definition of passion, I realized our roots are taking hold and supporting the goal towards a legacy.” Roger says.